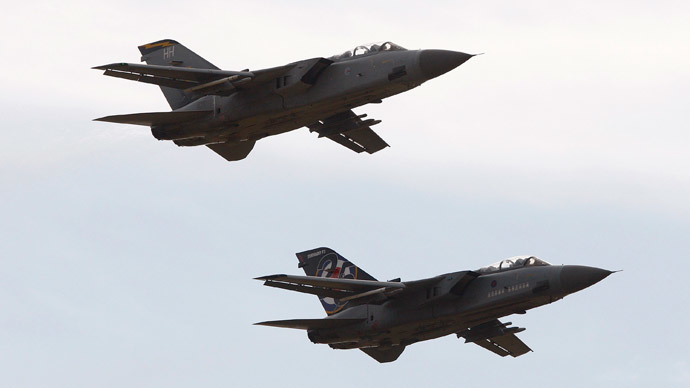 The Royal Air Force (RAF) has had to order a new batch of 500lb (227kg) bombs to continue its airstrikes in Iraq after the intensity of operations against Islamic State has caused them to run low. The RAF is said to have carried out 300 strikes since it began contributing personnel and combat aircraft to the operation in September 2014. “Ican confirm that there are discussions over the replenishment of Paveway IV stocks,” a Ministry of Defence (MoD) spokesperson said in a statement. Paveway IV is a 500lb bomb used by the RAF to arm Tornado and Harrier aircraft and is supplied by defense giant Raytheon. The last major order of Paveway bombs – which cost an estimated £30,000 each – came in the wake of the air war against Libya in 2001. The order is thought to have totaled around £60 million pounds. Last month the MoD announced it would be expanding its air operations – which have been criticized as variously misguided and counterproductive – to involve UK soldiers on the ground in a “training” role helping “moderate” Syrian opposition forces. Defence Secretary Michael Fallon insisted the Islamic State (IS, formerly ISIS) could only be defeated by local forces on the ground in Syria and Iraq. He said Britain remains a leading force in ongoing international efforts to support Iraq in its fight against the terror group. UK forces’ “effective and closely coordinated activity in conjunction with Iraqi and Kurdish ground forces has largely stalled the terrorists’ advances,” he added. The planned purchase also comes at a time when defense spending has been subject to a series of rows between politicians and military chiefs in the run up to the general election on May 7. A central strand of the debate has been Britain’s ability to spend the 2 percent of gross domestic product (GDP) on defense required of NATO member states and the UK’s wider strategic standing in the world.